Outside, the Enforcers were licking their wounds after the thrashing Street had given them. A few were tending to the commando who'd been flung against the side of the car earlier. Wrecked vehicles lay strewn about the power plant lot. Suddenly, they heard alarms and a computerized voice being announced via external speakers. "Radiation leakage at dangerous high level! Meltdown imminent!" Nearby, Murdoch sat up, very confused. The last thing he remembered was telling his fellow prisoners that Megakat Swamp would be a good place to hide from the Enforcers. Now they were nowhere to be found, and he had two holes torn in the back of his shirt he couldn't account for... and the very Enforcers he'd sought to escape were mere yards away! Fortunately for him, they didn't seem to be in any condition to bother stopping him if he attempted to run. And, indeed, upon that announcement over the PA, he gasped, got to his feet and ran off. Nobody noticed or bothered stopping him. Street's body shuddered. He dropped the empty flask, which shattered, his skin bubbling, expanding to tumorous proportions, ripping out of what little remained of his torn and ragged clothing, his brown fur darkening, turning black, his features and limbs distorting and then disappearing. As the SWAT Kats and Ann backed up cautiously, they realized Street was transmogrifying into a huge, thick, black, slimy cocoon! "Oh, gross...!" cried a disgusted T-Bone. "What was that stuff he poured on himself?!" "It must've been whatever he stole from Megakat Biochemical Labs!" replied Razor. He turned to Ann. "You need to get out of here, pronto!" "But--" the reporter tried to protest. "No 'buts!'" Razor insisted. "Go!" Miffed, Ann turned and fled. At the Enforcer blockade surrounding the power plant, Feral peered through his binoculars. Feral lowered the binoculars, blinked, then raised them again, gawking at the hideous sight of Street cocooning himself. After making sure Jonny got looked at at the ER for the lump on his head, Ann Gora returned to her new apartment in the recently opened Skycor Towers, glad that her cameraman was going to be all right. Skycor was a very large building and despite its motto being "Luxury Living at an Affordable Price," it cost an arm and a leg to pay rent in, and even though her apartment was one of the smaller ones, and she was paying less than she'd paid at her old apartment in Megakat Heights, Ann was still living above her means. Not that she minded. Even though she was late on her full rent now and again on a mere field reporter's salary, she liked the luxurious apartment and she liked the view of Megakat City's skyline even better. Her ultimate goal with regard to Skycor Towers was a penthouse, several stories above where she currently lived. There, she knew that the view of the city would be even better. The passengers in the last remaining subway train car looked out the windows as the one-eyed bacteria monster loomed menacingly over Razor. Razor revved the Cyclotron's engine. Vroom, vroom! He was beyond enraged. "Come and get me!" he yelled. The monster snarled, a nasty, a nasty, phlegmy sound. It clenched and unclenched its huge slimy purple hands as though in indecision, but if it was actually thinking anything, it wasn't immediately apparent. Its single eye simply glared with evil stupidiy, gaping maw curled into the same openmouthed smile as always. 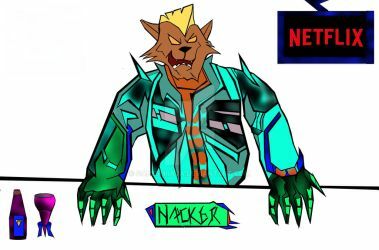 Razor popped a wheelie, turning in place, trying to do his best to look appetizing to the beast, intending on luring it away from the train car, to get it to chase him off down the subway tunnel, away from the few remaining kats he'd gotten there in time to save. YES , I dont like Chrissy's CANON arts but I haven't upload edited pictures this time.. GOD Swear.. I dont know who is on that CALLIE BRIGGS ID.. And dont blame me, dont use nasty words for my country.. If you all hate me HATE but dont say worst about my Country.. And I GOD SWEAR telling you all I haven;t posted A single edited pics this time... Better all find that imposter who is spreading this.. because he or she will do wrong and I have to hear nasty words.. WHY????? Its hurts a lot.... not fear.. Or is it my fault if somebody posted edits pics?? I cant be reason of anything... and over GOD SWEAR I have to say nothing. Dont bliv me, GOD knows the truth.. thats all.. Thank you for accepting me. I'm honored. I've been a fan of the SWAT Kats for as long as I could remember, and was mad for whatever reason it was cancelled when I was waiting for the defeat of all the bad guys and the city would give the SWAT Kats a party celebration and even the key to the city. 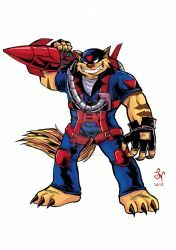 I'm so looking forward to a reboot of SWAT Kats. It should be interesting, and even the update on even the cast for the voices of the characters. Especially of T-Bone and Razor. On what day, month, and year would Jake Clawson birthday be? ATTENTION ALL SWAT KATS ARTISTS!!! There is an art thief going around that does not like OCs with canon characters, so she will steal your picture and edit it to her liking. Most notably, she does not like Jake/OC pics as shown in this album: www.facebook.com/pg/swatkatsTB… . Hey guys! Sun Star here. That’s my callsign by the way. 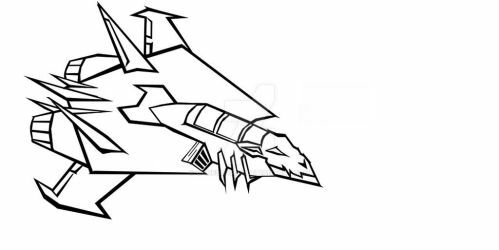 I always wanted to do episode discussions about SWAT Kats: The Radical Squadron. This one always gets me baffled. In episode 6 T-Bone stabbed the Pastmaster’s dragon with the dragon sword attched to the missle and both the Pastmaster and the dragon evaporated into thin air. But in episode 15 the Pastmaster comes back to Megakat City and causes trouble. How is it possible?! In regards to my old Swat Kats and Yugioh 5Ds fanart from my previous account which I forgot the password for, I will repost them on my current account when the new series gets going. My old account also has crossover art for the two. Hey guys! 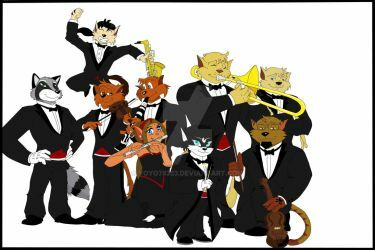 Enclosed is the petition for SWAT Kats Revolution. Help us fight the battle. See you soon, Sun Star. Can I join you guys? I would love to join this club. I must be proved worthy. I know every episode by heart.